There are some homeschool materials that I will grab if our house ever catches fire. Today, I’m telling you about one. 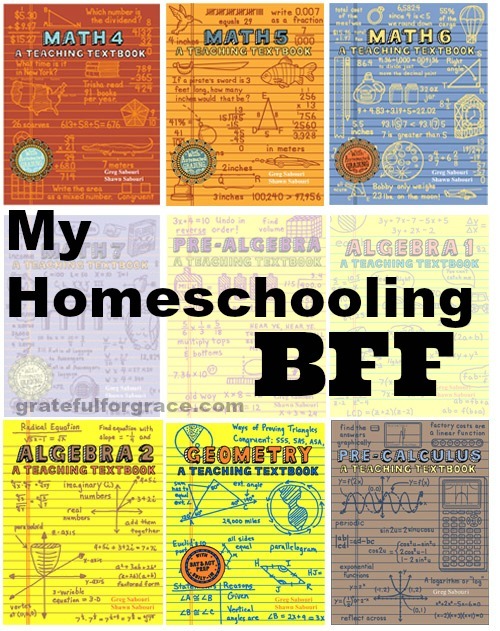 It’s one of t wo BFFs in my homeschooling world. About seven years ago, I was drowning in math papers and time spent teaching math. Having four students in our homeschool, I needed some time freed up and I needed to cultivate independence. Immediately, math was the subject I hoped I could delegate in a way that would be beneficial to all of us. I also knew higher math was on the horizon. I had told Paul the first year we started homeschooling that he was going to get to teach the high school arithmetic subjects because they made me break out in hives as a teenager and I knew it would be no different as the teacher. And that’s when the heavens parted and Teaching Textbooks descended into my life. Forever changing it. Seriously. Ok. I really am serious. Teaching Textbooks teaches the lesson and grades the problems. Oh, yes. I said grades it. It is a spiraling program. It has fun characters that each child can choose at her “cheerleader”. It has animation as well as voiced instructions that draw the child’s attention. It includes a workbook as well as the CDs. It includes computation as well as theory, as age appropriate. It reteaches every problem that is missed. And it grades the work. Oh, I already said that. Do you hear angels singing? I do. We started using Teaching Textbooks when HB was in seventh grade, I believe. She loved it. Now, everyone except Paul Louis is using it. We don’t start our kids in Teaching Textbooks until fourth grade. Personally, we like having hands on manipulatives through third grade, so we use Right Start Math until the child is ready for Teaching Textbooks. For high school especially, this saves me tons of time and tears. My time. My tears. One of the big benefits is that you can have a student redo a lesson if they do not get the minimum grade you require. You sign in as teacher, delete the lesson’s work, and have them do it again. The teacher can also check the grade book at anytime. If you have more than one student on the same level, you can even register more than one student in each “grade”. They sign in individually to do their work and each student has their own grade book. It’s not a cheap program, but it’s worth every penny to me. Especially since I can reuse it with the next child in line when they get to that “grade”. So… if you see smoke at my house and me running down the road with little glossy, colored packs of CDs, you know Teaching Textbooks was saved. Gotta always save the BFF. Next post: Baby Girl is Fearfully & Wonderfully Made!